New Zealand Prime Minister John Key, right, speaks to delegates at the signing of the Trans-Pacific Partnership agreement in Auckland, New Zealand, Feb. 4, 2016. Deal cuts taxes, trade barriers for nearly half of world's economy; President Obama praises accomplishment, while critics see risks to jobs, health, environment. Twelve Pacific region trade ministers signed the Trans-Pacific Partnership in Auckland, New Zealand, on Thursday — a broad free-trade deal that will cut taxes and trade barriers for nearly half of the world's economy. Trade Representative Michael Froman signed for the United States. All the ministers said their goal is to "enhance shared prosperity, create jobs and promote sustainable economic development for all of our nations." The agreement is considered one of President Barack Obama's proudest achievements in his seven years in office. Obama issued a statement saying the deal will bolster American leadership abroad and support good jobs at home. He said he will push U.S. lawmakers to quickly ratify the deal. "I'll continue working with Democrats and Republicans in Congress to enact it into law as soon as possible,” he said, “so our economy can immediately start benefiting from the tens of billions of dollars in new export opportunities. We should get TPP done this year and give more American workers the shot at success they deserve and help more American businesses compete and win around the world." It took seven years of often contentious negotiations to complete the trade deal. The deal basically reduces tariffs and trade barriers for numerous goods and services, including cars, medicines and dairy products. It also sets rules for labor and environmental protection, and protects intellectual property rights for multinational corporations. 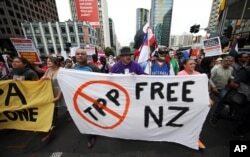 Protesters march to the venue of the Trans-Pacific Partnership signing in Auckland, New Zealand, Feb 4, 2016. Parliaments and legislatures of all 12 countries must ratify the deal. Many in the U.S. Congress oppose it for various reasons. Opponents say the pact will cost American jobs, flood the U.S. market with foreign products, harm the environment and threaten human health with unsafe imported food. But the White House has said the agreement will cut 18,000 different taxes on U.S. exports and open the globe to more American-made products, plus it has the strongest labor and environmental protection ever included in a global trade deal. Along with the United States, the other partnership members are Australia, Brunei, Canada, Chile, Japan, Malaysia, Mexico, New Zealand, Peru, Singapore and Vietnam. China, the world's second-largest economy, decided not to join the trade pact as it pursues its own economic agenda. But U.S. officials have said the Chinese are welcome to become a partner when they think the time is right.